Canada’s cities are falling down – bridges and overpasses are crumbling, water and sewer pipes are leaking and oversized potholes threaten to swallow small cars. McGill civil engineering professor Saeed Mirza is concerned that our children will inherit a country beyond repair unless there is immediate intervention. “Approximately 79 per cent of Canada’s infrastructure is already beyond its anticipated service life, and Quebec is one of the worst-hit provinces,” Mirza says. The structures most in need of repair include waste-water pipes and water treatment facilities. Mirza says approximately 40 per cent of Montreal’s clean water is lost because of leaking pipes. No sewer-contaminated water has leached into our drinking water yet, but we are flirting with disaster. Mirza’s interest in infrastructure peaked during the 1980s when deterioration became a hot topic. Recognizing a lack of both national policy and government funding, he became involved with Canada’s InfraGuide, an association created by the Federation of Canadian Municipalities and the National Research Council. InfraGuide helps determine best practices to improve infrastructure in Canada. Mirza and a coalition of engineers, policy makers and professional organizations are also advocating a National Infrastructure Policy to provide long-term direction on all infrastructure matters. Mirza has changed undergraduate and graduate curricula to include courses about maintenance, repair, rehabilitation and rational management of deteriorating infrastructures, but his rethinking goes beyond the classroom. Research funded by the Natural Sciences and Engineering Research Council of Canada involves observing and classifying the degradation of Montreal’s infrastructure. 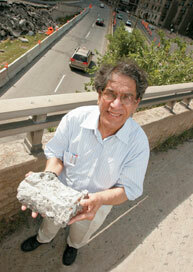 In spring 2005, his graduate students photographed hundreds of potholes around Montreal. By analyzing size and location, and considering materials and drainage, they hope to determine the best strategy for long-term repairs. His students are also examining the condition of Montreal’s bridges and overpasses, with an eye to developing material and designing structures resistant to weathering and oxidation. And they are studying the behaviour and design of concrete structures.